The second edition of Corruption and Government updates Susan Rose-Ackerman's 1999 book to address emerging issues and to rethink old questions in light of new data. The book analyzes the research explosion that accompanied the fall of the Berlin Wall, the founding of Transparency International, and the World Bank's decision to give anti-corruption policy a key place on its agenda. Time has vindicated Rose-Ackerman's emphasis on institutional reform as the necessary condition for serious progress. The book deals with routine payoffs and with corruption in contracting and privatization. It gives special attention to political corruption and to instruments of accountability. The authors have expanded the treatment of culture as a source of entrenched corruption and added chapters on criminal law, organized crime, and post-conflict societies. The book outlines domestic conditions for reform and discusses international initiatives - including both explicit anti-corruption policies and efforts to constrain money laundering. Introduction; 1. What is corruption and why does it matter? ; Part I. Corruption as an Economic Problem: 2. Bureaucratic corruption; 3. Corruption in procurement and privatization; 4. Reducing incentives and increasing costs; 5. Civil service reform and bureaucratic reorganization; 6. Using the criminal law to deter bribery and extortion; Part II. Corruption as a Cultural Problem: 7. Culture and corruption; Part III. Corruption as a Political Problem: 8. Politics, corruption, and clientelism; 9. Organized crime, corruption, and money laundering; 10. Corruption in post-conflict state building; 11. Democracy: corruption, connections, and money in politics; 12. Accountability beyond the ballot box; Part IV. Reform Agendas - Domestic Political Will and International Influence: 13. Domestic conditions for reform; 14. The role of the international community; 15. The role of international cooperation: states, firms, banks, and organized crime; Part V. Conclusions: 16. Conclusions. "Susan Rose-Ackerman has been a powerful ally of Transparency International (TI), from its very beginnings more than twenty years ago. Through her writing, teaching, and speaking she accompanied our battle against corruption with her thoughtful, sometimes critical, economist perspective of our activism. 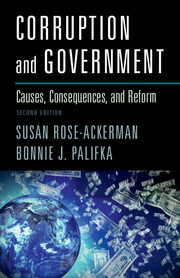 The first edition of this book came out just in time, to help strengthen the conceptual framework of fighting corruption in various institutions, and the anti-corruption community will be grateful to Susan and her coauthor, Bonnie J. Palifka, for producing the new edition of this seminal work. The strong conceptual economic framework provided in this book will be needed for practitioners, teachers, scholars, and the media as we continue our battle against the scourge of corruption." "A timely update to a classic, including many new insights from the burgeoning field of corruption research. The new and improved edition of Corruption and Government is essential reading to anyone interested in the problem of corruption, and what to do about it." "When first published in 1999, Corruption and Government was a pioneering achievement that instantly became a landmark book, defining many of the central themes for research in this area. This new edition is nothing but a real "tour de force". Rose-Ackerman's powerful political-economic approach is expanded into several new areas such as organized crime and corruption in post-conflict societies. A wealth of recent empirical studies that are presented for illuminating the analysis and the discussion of possible reform agendas also makes this a highly relevant book for the expanding international anti-corruption regime." "Its engaging and confident presentation of the fundamentals of corruption made this book a standard reference in any informed discussion about the problem. This second version keeps focus on what institutional structures produce incentives for administrative and political corruption, while the reader also learns how corruption research and law enforcement have expanded (and stagnated) over the last fifteen years. The book is a must-read for anyone seriously interested to learn what it takes to fight corruption." "This revised and expanded edition is a further great contribution to the fight against corruption in all its forms. While the authors observe on the substantial progress that has been made, they acknowledge the difficulties in achieving a comprehensive global agreement, when national interests and values differ. Let us all hope that legislators and leaders throughout the world will recognize the common benefits of adopting the actions here recommended."